This is the first step you take when starting to look into trading. you know that its a good way of making money because you've heard so many things about it and heard of so many millionaires. Unfortunately, just like when you first desire to drive a car you think it will be easy - after all, how hard can it be? Price either moves up or down - what's the big secret to that then - lets get cracking! Unfortunately, just as when you first take your place in front of a steering wheel you find very quickly that you haven't got the first clue about what you're trying to do. You take lots of trades and lots of risks. When you enter a trade it turns against you so you reverse and it turns again .. and again, and again. You may have initial success, and thats even worse - cos it tells your brain that this really is simple and you start to risk more money. You try to turn around your losses by doubling up every time you trade. Sometimes you'll get away with it but more often than not you will come away scathed and bruised You are totally oblivious to your incompetence at trading. This step can last for a week or two of trading but the market is usually swift and you move onth the next stage. Step two is where you realise that there is more work involved in trading and that you might actually have to work a few things out. You consciously realise that you are an incompetent trader - you don't have the skills or the insight to turn a regular profit. You now set about buying systems and e-books galore, read websites based everywhere from USA to the Ukraine. and begin your search for the holy grail. During this time you will be a system nomad - you will flick from method to method day by day and week by week never sticking with one long enough to actually see if it does work. Every time you come upon a new indicator you'll be ecstatic that this is the one that will make all the difference. You will test out automated systems on Metatrader, you'll play with moving averages, Fibonacci lines, support & resistance, Pivots, Fractals, Divergence, DMI, ADX, and a hundred other things all in the vein hope that your 'magic system' starts today. You'll be a top and bottom picker, trying to find the exact point of reversal with your indicators and you'll find yourself chasing losing trades and even adding to them because you are so sure you are right. You'll go into the live chat room and see other traders making pips and you want to know why it's not you - you'll ask a million questions, some of which are so dumb that looking back you feel a bit silly. You'll then reach the point where you think all the ones who are calling pips after pips are liars - they cant be making that amount because you've studied and you don't make that, you know as much as they do and they must be lying. But they're in there day after day and their account just grows whilst yours falls. You will be like a teenager - the traders that make money will freely give you advice but you're stubborn and think that you know best - you take no notice and overtrade your account even though everyone says you are mad to - but you know better. You'll consider following the calls that others make but even then it wont work so you try paying for signals from someone else - they don't work for you either. 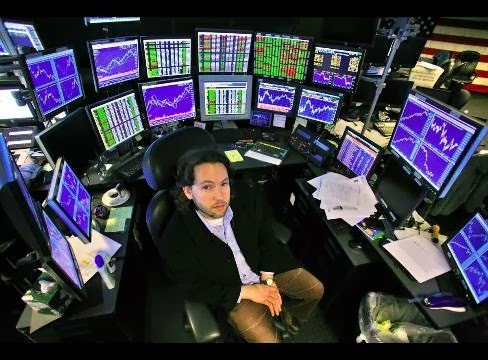 You might even approach a 'guru' like Rob Booker or someone on a chat board who promises to make you into a trader(usually for a fee of course). Whether the guru is good or not you wont win because there is no replacement for screen time and you still think you know best. This step can last ages and ages - in fact in reality talking with other traders as well as personal experience confirms that it can easily last well over a year and more nearer 3 years. This is also the step when you are most likely to give up through sheer frustration. Around 60% of new traders die out in the first 3 months - they give up and this is good - think about it - if trading was easy we would all be millionaires. another 20% keep going for a year and then in desperation take risks guaranteed to blow their account which of course it does. What may suprise you is that of the remaining 20% all of them will last around 3 years - and they will think they are safe in the water - but even at 3 years only a further 5-10% will continue and go on to actually make money consistently. By the way - they are real figures, not just some ive picked out of my head - so when you get to 3 years in the game dont think its plain sailing from there. Iv had many people argue with me about these timescales - funny enough none of them have been trading for more that 3 years - if you think you know better then ask on a board for someone who's been trading 5 years and ask them how long it takes to become fully 100% proficient. Sure i guess there will be exceptions to the rle - but i havent met any yet. One day - im a split second moment you will enter stage 3. Towards the end of stage two you begin to realise that it's not the system that is making the difference. You realise that its actually possible to make money with a simple moving average and nothing else IF you can get your head and money management right You start to read books on the psychology of trading and identify with the characters portrayed in those books and finally comes the eureka moment. The eureka moment causes a new connection to be made in your brain. You suddenly realise that neither you, nor anyone else can accurately predict what the market will do in the next ten seconds, never mind the next 20 mins. You start to work just one system that you mould to your own way of trading, you're starting to get happy and you define your risk threshold. You start to take every trade that your 'edge' shows has a good probability of winning with. When the trade turns bad you don't get angry or even because you know in your head that as you couldn't possibly predict it it isn't your fault - as soon as you realise that the trade is bad you close it . The next trade or the one after it or the one after that will have higher odds of success because you know your system works. You stop looking at trading results from a trade-to-trade perspective and start to look at weekly figures knowing that one bad trade does not a poor system make. You have realised in an instant that the trading game is about one thing - consistency of your 'edge' and your discipline to take all the trades no matter what as you know the probabilities stack in your favour. You learn about proper money management and leverage - risk of account etc etc - and this time it actually soaks in and you think back to those who advised the same thing a year ago with a smile. You weren't ready then, but you are now. The eureka moment came the moment that you truly accepted that you cannot predict the market. You are now at a point where you break even most of the time - day in day out, you will have weeks where you make 100 pips and weeks where you lose 100 pips - generally you are breaking even and not losing money. You are now conscious of the fact that you are making calls that are generally good and you are getting respect from other traders as you chat the day away. You still have to work at it and think about your trades but as this continues you begin to make more money than you lose consistently. You'll start the day on a 20 pip win, take a 35 pip loss and have no feelings that you've given those pips back because you know that it will come back again. You will now begin to make consistent pips week in and week out 25 pips one week, 50 the next and so on. Now we’re cooking - just like driving a car, every day you get in your seat and trade - you do everything now on an unconscious level. You are running on autopilot. You start to pick the really big trades and getting 200 pips in a day doesnt make you any more excited that getting 1 pips. You see the newbies in the forum shouting 'go dollar go' as if they are urging on a horse to win in the grand national and you see yourself - but many years ago now. This is trading utopia - you have mastered your emotions and you are now a trader with a rapidly growing account. You're a star in the trading chat room and people listen to what you say. You recognise yourself in their questions from about two years ago. You pass on your advice but you know most of it is futile because they're teenagers - some of them will get to where you are - some will do it fast and others will be slower - literally dozens and dozens will never get past stage two, but a few will. Trading is no longer exciting - in fact it's probably boring you to bits - like everything in life when you get good at it or do it for your job - it gets boring - you're doing your job and that's that. Finally you grow out of the chat rooms and find a few choice people who you converse with about the markets without being influenced at all. You can now say with your head held high "I'm a currency trader" but to be honest you dont even bother telling anyone - it's a job like any other. I hope youve enjoyed reading this journey into a traders mind and that hopefully youve identified with some points in here. Remember that only 5% will actually make it - but the reason for that isnt ability, its staying power and the ability to change your perceptions and paradigms as new information comes available. The losers are those who wanted to 'get rich quick' but approached the market and within 6 months put on a pair of blinkers so they couldnt see the obvious - a kind of "this is the way i see it and thats that" scenario - refusing to assimilate new information that changes that perception. Ask yourself the question "how many years would you go to college if you knew for a fact that there was a million dollars a year job at the end of it? Take care and good trading to you all. I left of the name of the author of this piece by mistake. If anyone knows the name of the true author, please let me know and I'll add it here. Pls like our Facebook fan page to get more article to help you in your trading!